Cut the pumpkin into small cubes. Cook in water with a pinch of salt until soft. Drain and chill. Place the pumpkin, cream, yolks and sugar in a blender and process until smooth. 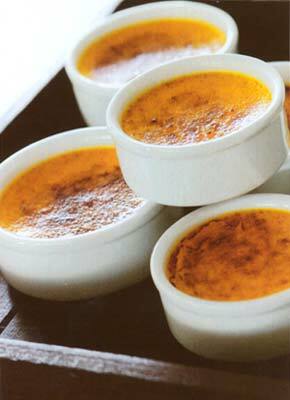 Split the vanilla pod lengthwise and scrap the seeds with a paring knife into the crème brûlée custard. Cast in ovenproof moulds and bake in a preheated oven at 80-90°C for 20 minutes. Sprinkle with brown sugar and caramelise with a hand-held torch or place the moulds under the oven grill to brown the top. For more food and wine stories and recipes, pick up the latest issue of Flavours (Sep - Oct 2005), Malaysia's premier food magazine, available at major bookstores and newsstands or email cir.ccu@thestar.com.my for subscription details.